Influencer Marketing has been around for a while, but hasn’t typically been something that the smaller businesses we work with have been involved with. With the rise of Instagram, in particular, that is changing, and there’s a new generation of more accessible – and arguably more effective – influencers out there. For smaller businesses in certain niches, this is something to be aware of and should be considered as part of a social media strategy. Firstly, the basics. In simple terms, “Influencer marketing” means “finding someone who your target customers pay close attention to, and inducing them to talk about your product or service to that group”. The way that a business does that might be entirely organic – for example, by providing the influencer with amazing service – but is more usually either by providing them with a covetable freebie in return for a review, or simply paying them to discuss something specific. In both of the latter cases, the influencer should disclose that they’re benefitting from the arrangement, although not all of them do. Can smaller businesses get involved in Influencer Marketing? At one point, this meant contacting “offline” celebrities and negotiating with them for exposure, and tended to be more the preserve of larger businesses. But since the rise of social media, and particularly Instagram, influencer marketing has become much more accessible to smaller brands. That’s for a few reasons, but mainly because the pool of “celebrities” has become much larger and more diverse. Instagram has allowed many “ordinary people” who have knowledge and enthusiasm for particular business sectors, to develop large and active followings. We call these people “micro-influencers”. So while you might not be able to afford a Kardashian’s fee for promoting your new range of swimwear, there may be a handful of Instagrammers who are realistically accessible to you – and may prove to be more, er, actually influential. Firstly, and most obviously, they tend to have a much smaller number of followers. 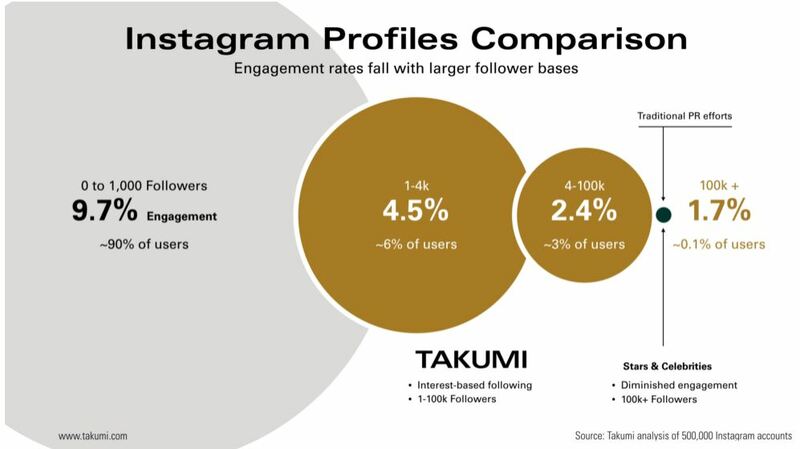 You might even be talking about closer to 1,000 followers on Instagram than 100,000. They’re often more focused in terms of what they post about (for example, skincare for teenagers with acne, or fashion for over 40s) which naturally reduces the pool of potential followers for them – this might be chicken or egg with the follower numbers! So why might engaging a Micro-Influencer be a better option for a business? Well, to start with, they’ve already narrowed down their audience – meaning that if they’re a fit for your brand, it’ll be a much stronger fit. So continuing the example of the Over 40s Fashion influencer, if you’re marketing classic, modest swimwear then their smaller and more focused audience is a bonus for you: it just means you’re not paying for exposure to teenagers who’ll never buy your product. The smaller size of a micro-influencer’s community also means they tend to be a lot more accessible to, and engaged with, their followers. Plenty of accounts start out by responding to comments and requests for advice from their followers, but as they grow, that often dries up. So in fact, a huge name in beauty blogging is less likely to achieve a single effective recommendation of your mascara, than someone who has a smaller community. Of course, regardless of the number of followers, they still need to be highly knowledgeable and respected by those followers. And finally, Micro Influencers are more accessible to you as a smaller business. Someone who doesn’t consider themselves a social media superstar is much more likely to be receptive to gifts or review requests, because they probably receive far fewer of them! What types of business benefit most? For this to work for your business, you need there to be an active and engaged community around your niche on Instagram. If there isn’t a suitable community, there won’t be micro influencers. We don’t want to generalise too broadly, but the kinds of niches where Instagram communities exist tend to be those which are discretionary purchases (so a new lipstick rather than a new fridge), often with an element of luxury; lack of transparency in brands’ “traditional” marketing is also a flag for this, as it leaves consumers craving personal recommendations with a higher level of trust. The Beauty sector is an obvious example of this. How do you evaluate a micro-influencer? So, you’ve identified some accounts who are creating content that’s highly attractive to your niche audience, have a reasonable number of followers, and appear to get some engagement from their followers (ie, most of their posts get Likes and comments). Before you decide to invest in working with them, there are a couple of other things to watch out for. Firstly, do a quick sense check of those followers. Click through to some of the followers’ biographies and posting grids; do they look like real people? Buying followers is rife on Instagram and it’s easy for the unwary to be fooled by a fraudent account. On a related note, look at some of the comments being left on their content. Seeing a large number which are incongruous, inappropriate, or repetitive, may also suggest that the account owner has paid for that activity. (Side note: even the best Instagrammers are afflicted by other users making use of bots to get their attention, so the odd follower who posts “Wow, amazing!” on every post shouldn’t be taken as a black mark – provided the genuine engagement is there too). Then, look at how the Instagrammer engages. Is the conversation more than superficial? Do they answer questions properly and maybe provide recommendations or advice? Those are your Influencer gold! And finally, watch out for the “sellout” Influencers. These users may have started out creating content around products that they personally love, but as their following grew, they got sent more and more freebies, until their feed just becomes a litany of random products with no quality opinion, just a parroting of what the manufacturer says. These accounts may have some use but they’re not going to be read as avidly, or be percieved as so trustworthy, as a genuinely passionate user. And while we’re on that subject, you also need to be prepared for the fact that the influencer *may* criticise some aspects of your product or service. Remember, trust and honesty are their major assets, and are why you wanted to work with them in the first place. So if they don’t like your product that much, they should explain why (and hopefully, who it might be suitable for). But ultimately, you have to accept their opinion. So, hopefully that has given you a start in understanding Micro Influencers – now, you just need to find that community!